dish. Photo courtesy Schwan’s. 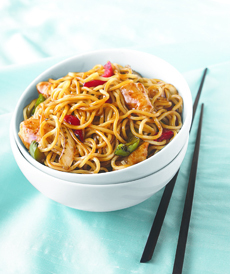 You can toss out the Asian food take-out menus now that Schwan’s offers a quick and easy way to enjoy great Asian food at home. Award-winning chef Jet Tila has recently introduced a new line of frozen meals that are ready to serve in 30 minutes or less. Just heat and eat! Three lucky winners will have their choice of two of the tasty meals; each of which serves two (except for the single-serve Thai Chicken Coconut Soup). Approximate Retail Value Of Each Prize: Up to $27.98. Learn more about Schwan’s by visiting Schwans.com. To Enter This Gourmet Giveaway: Go to the box at the bottom of our International Foods Page and click to enter your email address for the prize drawing. This contest closes on Monday, January 24th at noon, Eastern Time. Good luck!